So the AT wasn’t a real dream, it was a mirage. How did it move from the realm of imagination to the realm of . . . reality? That old adage is true – sometimes life hands you lemons, and you want to squirt them in other people’s eyes. No, wait. That’s not how it goes. Anyway, this is where I have to tell you a bit about me – just enough so that this crazy scheme makes sense. I am an anthropologist. I started studying anthropology at Bowdoin College under Dr. Leslie Shaw. Despite the absence of a true physical anthro program at CampBobo, Dr. Shaw took a young student with a burgeoning interest in this field and helped to create a study program that would support her in her future endeavors. Dr. Shaw brought in a box of deer bones from her excavation in Belize to teach me about osteology. She helped me put together an independent study on Tipu, Belize so I could delve into the bioarchaeology literature. And she, as well as my fabulous French professor, Dr. Charlotte Daniels, encouraged me to think outside the box when I graduated from Bowdoin and was ready for the next step in my academic career. After playing with deer bones, I eventually graduated to excavating and analyzing human skeletons. Among Dr. Daniels, Dr. Shaw, and myself, I filled out what amounted to over 300 pages of documentation in order to apply to a biological anthropology program in France. Graduating from the Université de Bordeaux I: Sciences et Technologies with a MSc in Paléoanthropology, Préhistoire, and Anthropologie Biologique a few years later, I had perfected my French, learned an incredible amount about anthropology, and most importantly had delved headfirst into a foreign culture and came out on the other side with lifelong friends and a new appreciation for the rewards of seemingly impossible (or at least rather daunting!) undertakings. In France, you may be excited about the Eifel Tower and delicious French food. I was psyched to score an internship with the National Institute of Preventative Archaeology (INRAP). What’s an anthropologist to do with a MSc? Not much. It turns out I fell into a field which requires a terminal degree to get anywhere (while staying in the field itself), so that’s what I pursued next. 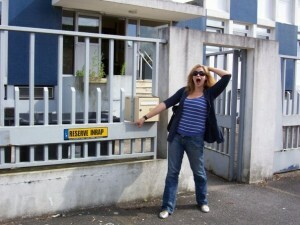 Shortly after leaving Bordeaux, I found myself ensconced in yet another new city. 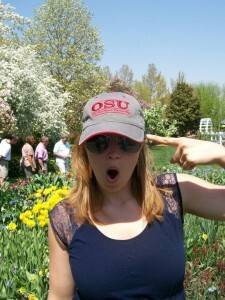 When I say, “OH”, you say, “IO!” That’s right, I’d moved to the land of scarlet and grey, the home of the Buckeyes, and the birth place of Jeni’s Ice Cream. 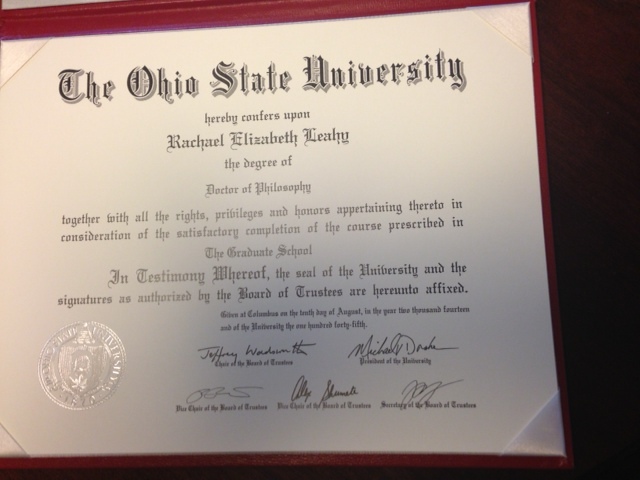 Four years of football games (yes, I drank the football kool-aid), lectures, teaching, writing, researching, and traveling later, OSU handed over my very own bright, shiny PhD. 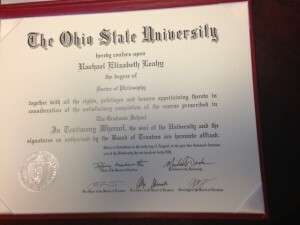 OSU handed over my bright, shiny PhD! This was it! I’d made it! My childhood dream (get a PhD), my college dream (a PhD in anthropology), and my adult dream (get this PhD and GET OUT OF SCHOOL FOREVER) all came true on a beautiful, sunny day in August. My friends and family came to graduation. We ate out at my favorite restaurant afterwards. I had to return my robe, but you’d better believe that I danced around the apartment in my graduation dress, hood, and tam. I had an interview for a tenure-track position. I was ready to go be a real scientist. Except . . . lemons. My first interview didn’t lead to a second interview. I sent out dozens of job applications and each was politely rejected with the same letter. “The pool of candidates was exceptionally strong for this position. We regret to inform you . . .” I could never make it as an actor – the endless rejections at auditions would wear me down and break me. And yes, the endless rejections did wear me down and break me. I spent eleven long months after graduating trying to find my school. The school with a position meant for me. And I did find it! I passed through two rounds of phone interviews, met their professors at a national conference, and was eventually flown out to this school for face-to-face interviews. Three candidates. One position. I was sure it was mine. . . And maybe it is. I don’t know – it’s been nine months since anyone at the school has contacted me (or deigned to return my emails), so maybe they are still going to hire me. But at this point, I doubt it. Hope springs eternal, but this spring is (currently) dry.